Every morning I, or occasionally my wife, start off the day by making tea. Specifically chai tea. 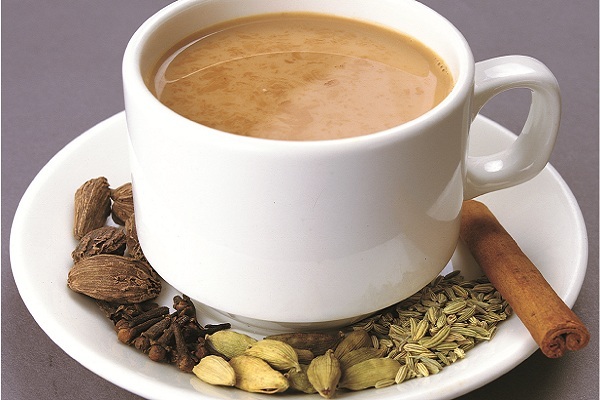 As an aside the word chai means “tea” in Hindi. In my dad’s language of Punjabi it would be cha. So in a way saying chai tea is like saying “tea tea” which makes no sense, but I am starting with the familiar, but I usually just say chai. I am half Punjabi and should say “cha” but communicating my caffeinated beverage of choice gets more difficult if I am used to saying cha. So first thing in the morning I wash the pot, if it is not washed already, and measure out the amount of tea I want to make. Usually about 4 mug fulls of water. I put the water on the stove and turn the burner on. As the water heats up I add an equal number of heaping teaspoons of loose Yellow Label Lipton tea. Then I take some green cardamom pods, whole cloves, fennel seeds, black pepper corns, and piece of cinnamon stick and put it all in a big stone mortar, and then take the heavy stone pestle and grind the spices and add it to the pot of water with tea in it. Once the water boils for a few minutes I add the milk. Whole milk, because chai without enough milk fat in it is wasted chai. 🙂 I add enough milk until the color looks right, and then I add a little bit of honey to sweeten it slightly. After the tea comes to a boil, I turn the burner off and pour the tea through a sieve leaving the spices and loose tea behind. Drinking that first sip of hot tea in the morning is a glorious feeling. Not only does it wake me up, but the taste which mixes the slight bitterness of black tea, the rich silkiness of milk, a blend of distinct spices, and a hint of sweetness from the honey has a solidness, a wholeness to it that I can’t quite describe. It feels like home to me as invokes many memories of growing up drinking tea with my family. At that time in my life I usually didn’t have morning tea, but late afternoon tea with my parents when they come from work. I introduced it to my wife when we met and she fell in love with it, and it is now as important to her as it is to me, and so it is now a shared pleasure. And on mornings when I haven’t had a lot of sleep, I may find making the tea to be a bit of a chore but that first sip in the morning makes me feel like I have the strength to face the day. The making and drinking of chai is a ritual for me. I think my only one. If I’m away from home I miss it and genuinely get excited for that first cup of chai when I get back. We all have our rituals. In many ways I feel like rituals are like beliefs, they are like habits, they are repeated actions and thus forge neural pathways in our brain which when activated release dopamine. I think we need ritual in our lives to a certain extent. A repeated activity that simply brings emotional comfort should never be seen as a bad thing. Of course the way ritual can feel so solid and tangible can also be dangerous. As I wrote out my ritual for making chai and how it makes me feel I think to myself how I could never be vegan. But perhaps I should be vegan. There are many positive scientific and ethical arguments for being vegan. This clash is at the heart of how are beliefs or our rituals impact how we rationalize away good arguments in favor of those practices and beliefs we hold dear. I think it’s also important to recognize that the tangible feelings those rituals give us are therefore an illusion. I remember when I was about 16 a friend of my mother’s, who was Greek Orthodox and cut hair in her home was giving me a haircut and talking about an upcoming Easter celebration. They were big meat eaters, especially lamb, but she announced to me that on Good Friday they don’t eat meat. She said “I don’t know, but not eating meat, makes me feel closer to God.” I found this to be such a strange statement, because I really felt like buddying up to God should really be more about helping people than whether or not you eat meat on Good Friday. It struck me at that moment how ritual influences our emotional state. And while I think we can afford some fantasy in our lives, when we get mired in ritual it is very much like an addiction. Ritual is like a drug for which we trade a certain euphoria we get by performing the ritual instead of actions that might be more productive to the lives of ourselves and others. The oft used example is quite true, that going to church every Sunday does not make you a good Christian. Many religious movements begin as an offshoot of other religions that seem to dogmatically get lost in ritual over more pragmatic practices that actually produce. Sikhism is a good example of this. This religion developed out of need to rise up from the oppression of the Mogul Empire in India at a time when the Hindus simply bore the oppression and turned to ritual and prayer for help instead of doing something themselves. Of course as the religion aged it too has become more mired in ritual as well, even though it began as a rebellion against it. “A ritual is a formula which is meant to dovetail our consciousness to the supreme consciousness of God. The whole purpose of a spiritual ritual is transformation of the heart – from selfish passions to a spirit of selfless service to others, from arrogance to humility and from envy to having the power to appreciate others. If this transformation doesn’t take place in our heart, to create good character, personal integrity and ultimately love for God, then these rituals are all a waste of time. The value of a ritual is to the extent we please God. Its not the ritual but the content of what our consciousness puts into that ritual. The real essence of all spiritual practices is to purify our heart and awaken the innate love of God. If our rituals are performed with that aim in mind, that ritual, like a vehicle, will help to transport our consciousness to the supreme destination. There is the analogy of a package. If you give a gift which has beautiful decorations outside but a horrible gift inside, the one who receives it will not be happy. The content of the package is all important. So our motivation for doing the ritual is all important, otherwise its just a ritual. So if we have the proper motivation to perform the ritual then it will have a tremendous substance. What is that substance? We access the empowerment and the mercy of the Lord. Thus by giving our heart to the Lord through that ritual, then that becomes the true content of the ritual. I’ve loved mangoes ever since I can remember. For me they are by far the tastiest fruit out there. Love probably isn’t the right word, but it’s the best I can do. I remember when I was young boy, my dad would cut up fruit for us to eat on Sunday mornings, and it was a real treat when mangoes would be in season. He would spend a lot of time cutting, and end up eating little. Very often I would eat an entire big mango in a sitting, and as the last piece was given to me I would express some faux-guilt about eating it all and my dad would look at me and say “don’t worry son, I’ve eaten so many mangoes in my life that you could never catch up to me anyway” and happily give me the last piece. He did grow up in India and I am sure he did have a lot of mangoes. Maybe to him it was like an apple. But I don’t know, if I had mangoes as readily available as apples I don’t think I would crave them any less. As I got into my teens, still every bit a mango fiend, and thought about someday sharing mangoes with my child I questioned my ability to be so generous. I mean sure I’d share, but give all of it to him? That’s not possible. 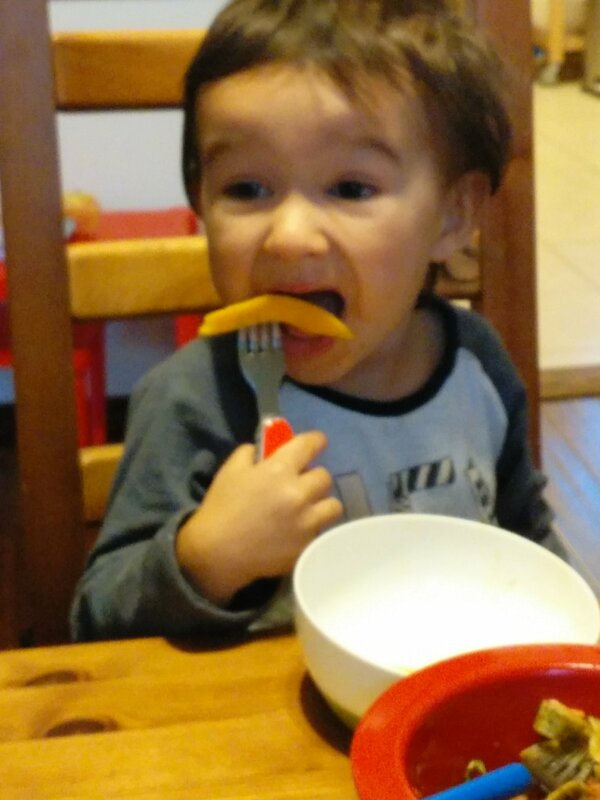 So here I am a parent and mangoes are in season and my son just loves them. And I am happy to say I know exactly how my dad must have felt. It makes me so happy to see that joy of being able to taste sweet, juicy, and wonderful fruit. I cut away, and feed him as many slices as he wants. 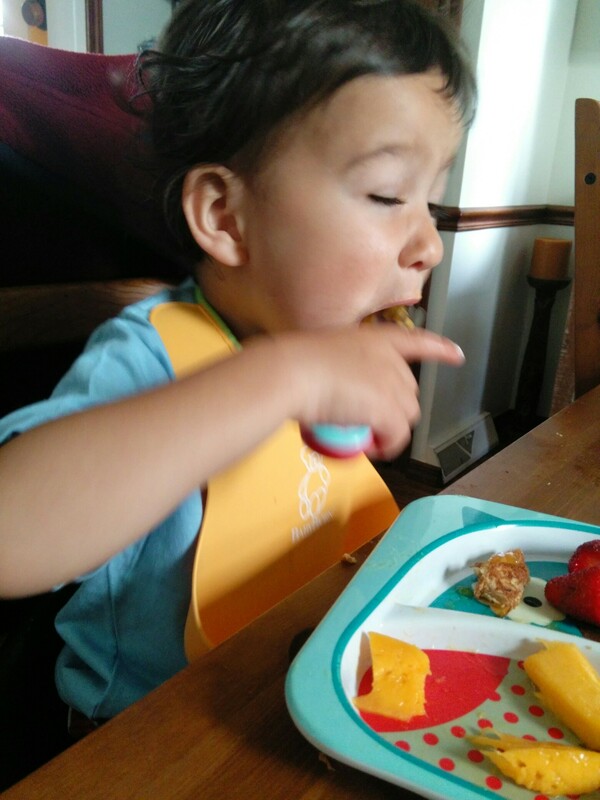 I feel grateful that I am able to give him his heart’s desire in the form of fruit (knowing that such fruit would be a luxury for many families) and I even think to myself how many mangoes I’ve had in my life, and maybe it’s not as many as my dad, but I’m happy to let my son try and catch up. His joy is so much better than a mango. It’s easy to get caught up in giving our kid the things we didn’t have when we were children, but thus far it seems a far more spiritually fulfilling experience to share with my son the things I did have that brought me joy, because I know what it feels like, and I can connect with him in a way that I couldn’t by simply giving him something I didn’t have. And if we feel positive about the people we are now, maybe those things you missed out on aren’t quite as important in the end. Dedicated to my toddler who I am watching for the 3rd day in a row on my own. For the first time. Mothers are awesome, but being a dad should be talked about a lot more. “Get out of the bath!” Child is speaking gibberish. “Do you want to get out of the bath?” Gibberish continues. I guess he doesn’t want to get out of the bath. I’ve reverted to an early civilization barter and trade system. “If you eat two more pieces of cucumber you will get ice cream. Two, just these two. Look they aren’t even that big”. “If you don’t brush your teeth, your teeth will hurt and fall out. Do you want that?” Child responds “Yeah”. “Yes, you can press the button!” I say it excitedly, he gets excited. It’s a great moment. But then daddy forgets and presses the button instinctively. Child goes “Waaaaaaaaaaaaahhhhh! Me! Me! Me!”. “OMG I’m sorry daddy forgot. No I am not bringing the elevator down again so you can press the button. “Waaaaaahhhhh”. “You just spilled chocolate milk everywhere…lets get out of those clothes.” Spill cleaned up. New clothes are put on…first sip…more chocolate milk on the clothes. Seriously? I was thinking we always love how we sound when we sing in the shower. His voice just babbling words as he plays with his bath toys is so meditative. These little sounds reverberate and are so peaceful. “It’s been a good 6 weeks since he peed his pants, that’s really good for his age, so it was bound to happen on my watch. I just spent 15 minutes doing some pretty sweet Charlie Chaplin moves to much delight and applause. Charlie Chaplin was in pretty good shape I have to say. It is at this moment I also realize that I will most definitely tire of doing it before he is tired of seeing it. Laughter will become tears. But even so, the laughter is worth it. I look in awe as he just eats 3 whole oranges one after another. He definitely won’t get scurvy on my watch. 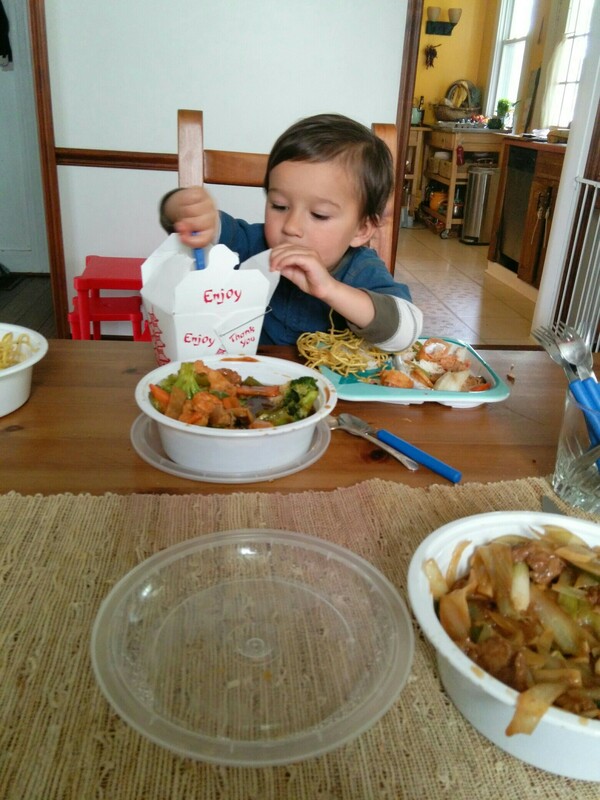 So you’re just going to eat the rice and the noodles and nothing else? Glad I spent 20 bucks on Chinese food. The most important thing to tell everyone about his trip with daddy to the zoo was that there were no giraffes. Admittedly it was also the thing he was most excited to be seeing after it was announced he’d be going to the zoo. Still it was an hour there and an hour back, we could start a little more positively. He’s having a sort of drunken low fade into sleep tonight. Like he did when he was about a year old. He’s be sweet and affection and babbling to himself in fits of drunken light-heartedness. I say “I love you” and he says “I do too”. That’s the first time he’s said that to me. I was listening to one of my favorite podcasts called The Hidden Brain on NPR and they were talking about the climate change situation in a great episode called Losing Alaska. Basically they were saying that scientific arguments have little merit anymore in talking about climate change. I would have to say that I agree. As someone who holds a Ph.D. in the Atmospheric Sciences I can most certainly say that few people that I have debated with on the subject truly understand the problem scientifically and I don’t claim to be the smartest person in the world, this is simply the truth. My field is applied math and physics. Not only that, the climate system is complex.it Involves interdisciplinary knowledge as well in chemistry, oceanography and geology. To change someone’s mind from a scientific point of view, it would take a lot of study and learning. Now you may be saying, wait I accept man-made climate change, and it it’s pretty obvious. Well I would argue that you don’t really understand it, but it’s easier for you to accept because it already fits in with your ideology. And I don’t say that to be demeaning, especially I don’t think it’s necessarily a bad ideology to have. Specifically the one in which we recognize that something is very complex and we don’t have years to study it on our own so maybe I should listen to what experts are saying. Much like we tend to believe our doctor when they tell us we have cancer as opposed to learning the requisite knowledge we need in order to test ourselves. 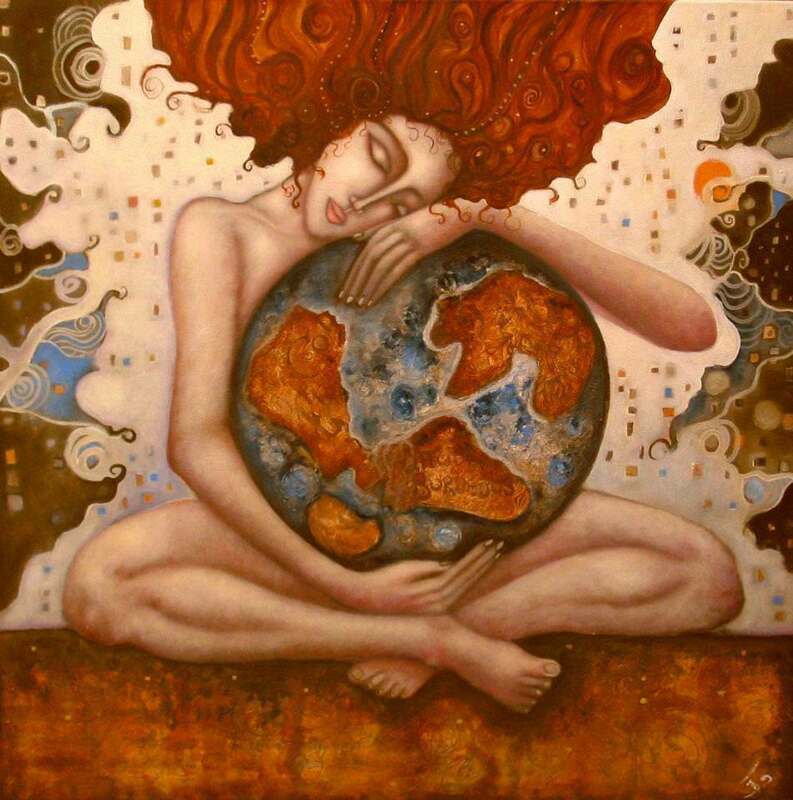 Instead of a Heavenly Father, maybe a Mother Earth isn’t a bad person to start worshiping. But more to the point it really does come down to our personal ideology whether we accept the science, because let’s face it the science is telling us some pretty harsh things. Not only is the Earth in a lot of trouble, but we actually might be responsible for it all. And in order to combat the problem we are causing we are going to have to give up a great deal. Transitioning away from a fuel source we heavily depend on will require large shifts in business and industry affecting the jobs of many. And of course such a transition cannot be made overnight, but even at a moderate pace will require a cultural change at a rate faster than many of us would have a hard time adjusting too. That of course does not make it any less compulsory. Interestingly this podcast made the argument that we all are capable of great sacrifices at times of war or crises, and that dealing with man-made climate change requires an approach that is used by religion rather than one that is used by science. I find myself having a hard time disagreeing. While I would love to live in a society where science had a much more powerful influence on changing minds ultimately it does seem that we need to change minds at an emotional level over an intellectual one (which is to me what the podcast suggested by saying a “religious approach”). In that vein, I wanted to address some of the main arguments I see used by climate change deniers, which tend to be more ideologically based instead of arguments that attack the scientific data on the subject. They are more dangerous to me, because they seem reasonable. They seem irrefutable. This is not the case. Science had been wrong before, why should we trust scientists? This is quite true. Scientists have been wrong before. In fact progress is actually built on that very premise. But notice the word “progress”. It always strikes me as strange that people overlook this aspect of science. Much like we learn from our own mistakes and grow and get better as people, this is how science works as well. So we do get things wrong, but we also get a lot of things right. Your daily lives in this modern world are a living result of that. From the car you drive to the device in which you are punching out your arguments. Now you could be right that someday we will discover that we were all wrong about this, but if we do, it will not because we were willfully trying to mislead people, but rather a new discovery has allowed us to view the world in a different way thus disproving our theory. So unless you’ve got that said discovery I can guarantee you that our assessment about the state of the climate system is based on the best available knowledge we have about how it works. And personally I see no shame in acting in the best interest of all on this planet based on what we know of it. Finally, just because you don’t trust science or want to focus on the things it got wrong makes it your problem, and not science’s problem. To refute climate change science on those grounds is to commit the genetic fallacy. Directly address the assertions being made by those advocating the position in terms of their conclusions analysis of their data. That is really your only option. To explain it more simply “Al Gore is a democrat, and I hate democrats. Al Gore gives evidence for why man-made climate change is happening, but since he is a democrat, he must be wrong.” That’s not how it works. Sorry. This argument is the same as the genetic fallacy because it is again an attempt to discredit to the reliability of the source to simply argue away what the source has to say. I’ll admit that in such instances I will use the same fallacious argument back, because, quite honestly two can play that game, and I can play it better. Let’s say all of us scientists are ego driven money-grubbing bastards. My options are renewable energy companies and liberal governments, or oil companies. Hmmm…I wonder who has more money. Not only that with all the other scientists clearly in the wrong camp, all that sweet oil money could be mine (as it was for Wei-Hock Soon) as there are even less people to share it with. In terms of fame, the fallacious argument made by deniers fall even shorter. If I had definitive proof that all the other scientists were wrong. I would be the one who was famous. I’d be on all the news programs, giving talks around the world on a sweet oil company payroll, and even the liberal media would have me on their shows even to abuse me while I valiantly stuck to my guns with the full conviction that I was doing my science right. I would be the hero of deniers everywhere. Sometimes even fallacious arguments are hardly worth the effort. 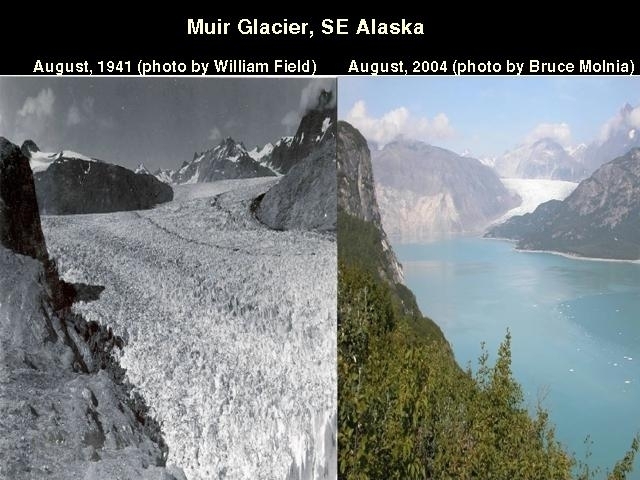 The climate has changed before when humans weren’t around. It’s natural. This is the first part of an argument constantly used. It’s also known in logic as a type of naturalistic fallacy. Just because something can happen naturally, doesn’t mean it can’t happen unnaturally. Do floods happen naturally? Sure. Can floods also happen because of human activities? Absolutely. 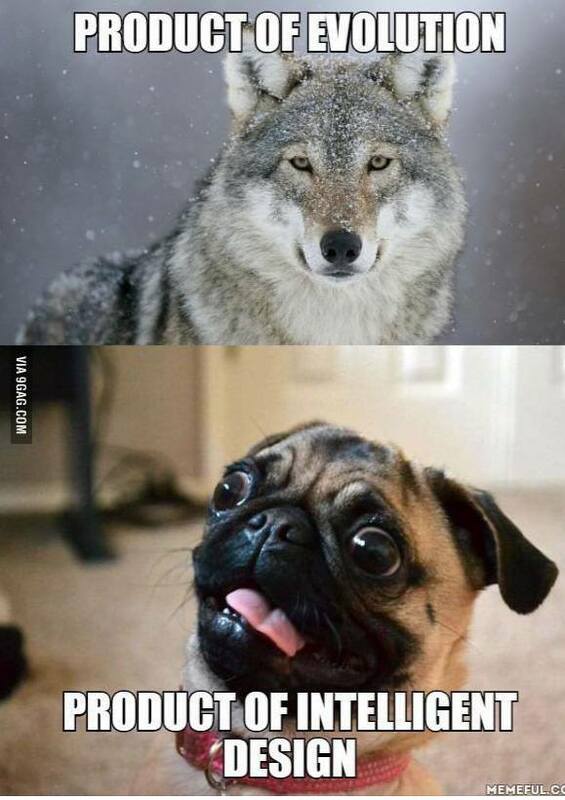 Natural selection happens in evolution. But you know what also happens? “Unnatural selection”. The fruits and vegetables we eat, the dogs and cats we have as pets, and the horses we ride are all examples of this. The same thing can happen with or without intention. We cannot have an impact on something as big as the Earth. The ecosystem formerly known as rain forest. This argument is made without any substantiation at all. It is often also used by people who are trying not to be religious but would rather take the James Inhofe argument that God controls the climate! Of course examples of how we have changed climate locally can be found all over through the building of structures like dams on rivers, cutting down forests and poor farming practices. In terms of the climate change issue specifically this person does a pretty nice break down of looking at how the amount of carbon we produce can quite easily explain the increase in carbon since pre-industrial levels. There is no reason to believe that we couldn’t have such a global impact. In fact that argument always seems to me a way of insulting or discrediting scientists again because it’s a pretty important question to answer before we would even start putting out evidence about climate change. I mean if the amount of carbon we produce paled in comparison to the amount of increase we’ve seen then I am not sure how the scientific consensus could be developed in the first place. It’s like when people say, the warming is being caused by the sun, and I think to myself “Oh my…we scientists all forgot to take into account the sun. I better make a few calls. Can’t believe we missed that one!”. The Earth will survive. We’ve had major disasters before and life persists. Whatever is going to happen is going to happen. Let’s say you are an emergency manager who works at a national park in a mountainous area. The weather is starting to warm and there has been heavy rains in the mountains and typically when such rains occur, especially in combination with some ice jams in the water flash flooding occurs. It’s not a guarantee, but likely. A town at the foot of the mountain in which the river runs through is going to get flooded, people could easily die if they are not warned. This is a natural event, it was going to happen whether humans are around are not do you warn them? Increased severity of extreme weather events. What’s more is that these types of things will adversely impact the most vulnerable of the worlds population. People who are in poverty. People who depend on subsistence farming. When local hazards happen communities do make sacrifices, and do look for solutions, through re-zoning laws, construction improvements, and other engineering solutions to try and make the world safer and have less loss of life. So even if man has nothing do with the problem it doesn’t mean that we don’t have a responsibility to act to come up with a solution. One can be logically sound but be ethically and morally irresponsible. Ignoring what experts are saying, making sweeping and unsubstantiated statements that there is nothing we can do, that it’s just nature, and the Earth will be fine is really the same as having the power to do something to save lives and not doing it. And this is why I agree that the conversation about climate change has to shift away from science and facts and be more about compassion, about love for our fellow human beings, valuing equality so that we all have the same chance to adapt and survive the changing climate, and about taking responsibility for the home that sustains us all. These are important values regardless of what is causing the climate to change and these are things we can address and even already have some solutions for. Of course I know that is even overly idealistic to think that such a solution of addressing people on an emotional level might work. Hell it’s difficult to find a religion that unanimously agrees poverty is something we should do something about. I feel pretty bleak in general about us actually doing something about climate change. It requires people to move beyond nationalism, beyond their own religious beliefs and worldview, which tend to not be very worldly at all. Maybe we can’t win against the forces of nature, but it sure would nice if we could overcome the forces that divide us as a species. We can try. Maybe in the end it really is easier to move mountains.